We are beginning to see the light at the end of the tunnel. Since January 2011, we have cleared the site, with the help of the Sons of the Confederate Veterans, and completely enclosed the site with chain link fencing. All of the graves have been surveyed. If anyone would like a copy of the plat, it will be made available to interested parties. This year we have had two of the brick vaults rebuilt, the sunken graves have been filled and broken headstones repaired and put back in place. There are no stones for the graves of Peter Hutchins and Mary Magdeline Marsalis, John Henry and Mary Marsalis (children of James and Dorcas Marsalis) and Robert Brown and Phoebe Marsalis Dickey, and will have to be purchased. We have had several donations toward the purchase of stones but we are still in need of monies to complete the final plans of the cemetery. We have had some very generous donations in the past, however, with the cost of fencing, surveying, and vault and stone repair the coffers are very low. Any contributions toward the purchase of the stones will be greatly appreciated. Pictures showing the original condition of the cemetery prior to starting the project were placed on the web page sometime ago. Pictures showing the condition as of the middle of May 2012 are attached with this progress report. The cemetery is to be visited this Monday, June 18, 2012, and additional pictures will be posted upon our return which will show the repaired headstones. A dedication will be held once the heat of the summer is over. Information regarding the dedication will be posted on the web page. This entry was posted in News on June 27, 2012 by admin. Peter’s grand mother’s name was Hannah Hutchins. 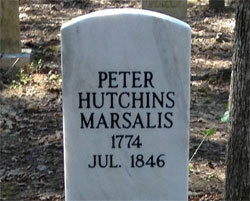 Peter’s great uncle Thomas Hutchins, the First Geographer General of the United States, surveyed areas throughout the southern states and later settled in the Natchez area. Peter, was an Indian interpretor, trail blazer, and Mississippi boatman. Whenever he was in the Natchez area he ofter stayed with his other great uncle, Anthony Hutchins, who owned and operated a 1000 acre plantation called White Apple Village outside of Natchez. In fact, this great uncle was instrumental in provided him with job opportunities, acquiring land, and eventually settling in the area. Sharon Marsalis, wife of Michael Marsalis, has taken up the research mantle of Mrs. Saxman and Crosby and is continuing their endeavors. 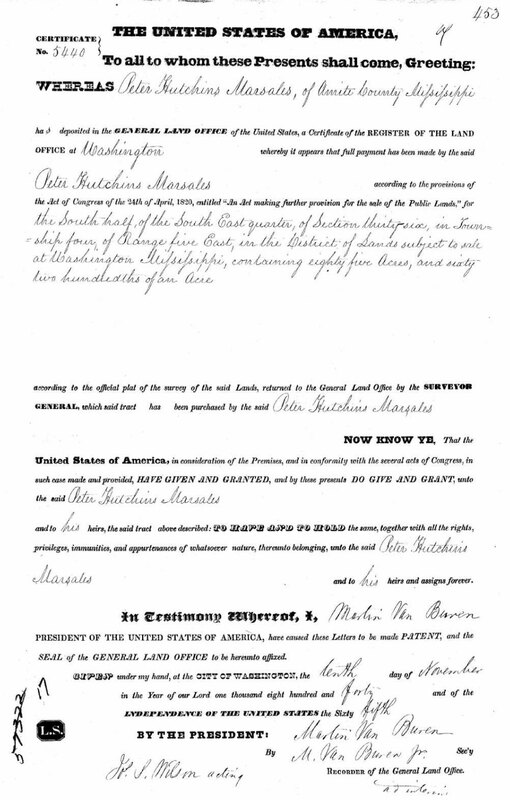 A month ago while perusing Ancestry she came across the original 1840 land grant of Peter H. Marsalis, which very clearly stated that Peter’s middle name is Hutchins. See copy. This entry was posted in News on September 30, 2009 by admin. This entry was posted in News on September 25, 2009 by admin. Tommy Wixon and Bill Marsalis revisited Liberty, MS on June 21st to continue Marsalis research at the court house. While there, they met Mickal Corkran, who is the executor to “Coot” Andrews the present owner of the property upon which the Marsalis cemetery is located. During their conversation Mr. Corkran told them how happy he was that someone was concerned about caring for the cemetery and agreed to provide them with a notarized affidavit granting them permission to enter the property. Since their meeting, they have heard that Mr. Corkran might know the location of a picture of the original Marsalis house. The next day, June 23rd, Tommy and Bill met at the cemetery with five members of Stockdale Cape #1681 Sons of Confederate Veterans. The purpose of the meeting was for possible assistance from their group with the cemetery clean up project. 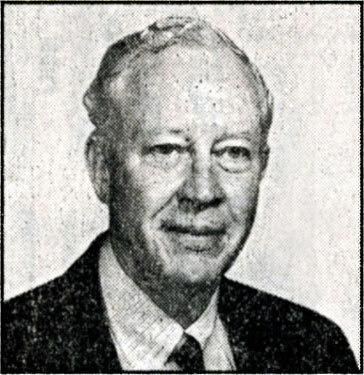 After looking at the site, Joe and James Abbott, Chuck Fredrick, Bill Simmons, and Leroy Spring all agreed that the clean up would be doable for them and that the project would be put up for discussion at their July meeting. Bill and Lynn Marsalis had planned to continue with the clean up at the cemetery on the 24th but Lynn became ill and the heat was too oppressive to consider further work and therefore was placed on hold. This entry was posted in News on July 10, 2009 by admin. 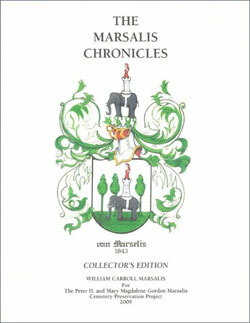 The 2009 Marsalis reunion was held at the Covenant United Methodist Church in Lafayette, LA on June 6th. Forty – three people attended, which was a light turnout compared to the two previous reunions. We had “cousin” from NC, AL, TX, and LA. Carla Ashbey (daughter of Carl Marsalis) and her husband Lewis hosted the reunion and saw to the food and all other preparations. Sharon Marsalis (wife of Mike Marsalis), one of our experts on the Marsalis family, had a number of family documents on display. Bill Marsalis gave a short presentation regarding the Marsalis cemetery restoration project. Chip Marsalis said that he needed a rest from the job of reunion organizing and that someone else would need to pick-up the mantle for the coming year. A group of Marsalis family members led by Bill & Marian Marsalis traveled to the Marsalis cemetery in Mississippi on March 19th, 2009. In addition to Bill and his wife, Richard Lynn Marsalis and his son Chris Marsalis from Ashland, MS helped in the effort to clear the area and see what all may lie beneath. They brought tools and cut down scrub and even some trees nearly 5 inches in diameter. 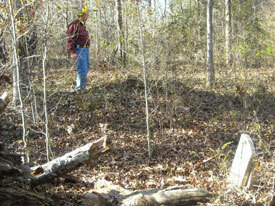 The tombstones are more in the open now and Bill thinks more graves will be found. In fact, they found a new foot stone labeled “baby” with nothing else legible. 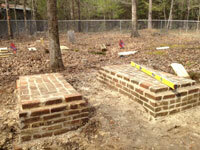 They also found several headstone bases without headstones. Pam and Tommy Wixon also showed up at the cemetery on the 20th and brought the newly printed books to Bill Marsalis. Please look for ordering instructions on this website to appear in upcoming days as we all get setup and ready to ship. This entry was posted in News on March 26, 2009 by admin. 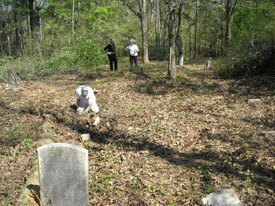 We are sorry to report that the Marsalis Cemetery in south Mississippi is in very poor shape. 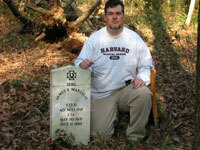 The cemetery contains the graves of Peter H., Polly, and many of our early Southern Marsalis ancestors. Without restoration, this cemetery could fade entirely from history. It is our desire to rebuild and preserve this landmark for future Marsalis generations. There is no question that is that Peter H. is the patriarch of all the Southern Marsalis’ in Mississippi, Louisiana, and Texas. It would be a shame to stand by and watch the loss of his tomb to time and the elements of nature. This entry was posted in News on March 5, 2009 by admin.